within the span of a week falls my birthday, my husband's birthday, and our anniversary. this makes for far more cakes and meals out than our stomachs can handle in one week (well, i could probably handle the cake part). in an effort to curb celebration fatigue this year, we decided that we would celebrate just our wedding anniversary on the actual date and would celebrate half birthdays in lieu of real birthdays. this seemed like a great plan for spacing out the celebration...until we forgot that we made it. (today is josh's half birthday and no cakes have been baked. in fact, i'm working late and he's going to small group tonight. our paths won't cross until about 11pm. happy birthday, honey?). once we realized that the half birthday thing wasn't going to work out, josh suggested that we celebrate spontaneous birthdays this year. the theory being that out of the blue one of us would declare any random day as a the other's birthday and would plan some type of celebration/gift. being the calendar brain that i am, i was initially a bit skeptical about this idea. but josh did pull off a pretty incredible spontaneous getaway weekend earlier this month (we spun a bottle on the counter, drove two hours in the direction it was pointing, ended up at a beachfront inn on the cape, and loved every moment of the adventure), so i decided to go with it. on his way back from work on saturday, josh called and announced, "happy birthday!" and told me to stay in the spare room until he came upstairs. when he got home, i walked into the kitchen and found this homemade coffee table waiting for me. my brother had found this window on the side of the road and given it to josh a while ago; josh paired it with some pallet board and turned it into a rustic-looking coffee table to fit our vintage theme. 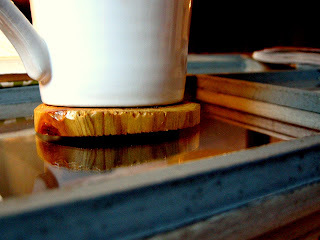 and check out these sweet homemade coasters that our friends gave us as a wedding gift. now i can put them to good use! now it's my turn to plan a spontaneous birthday for josh. power tools and i don't get along, so there won't be any more sweet furniture creations, but we'll see what kind of surprises i can muster. That table is awesome, Heather! 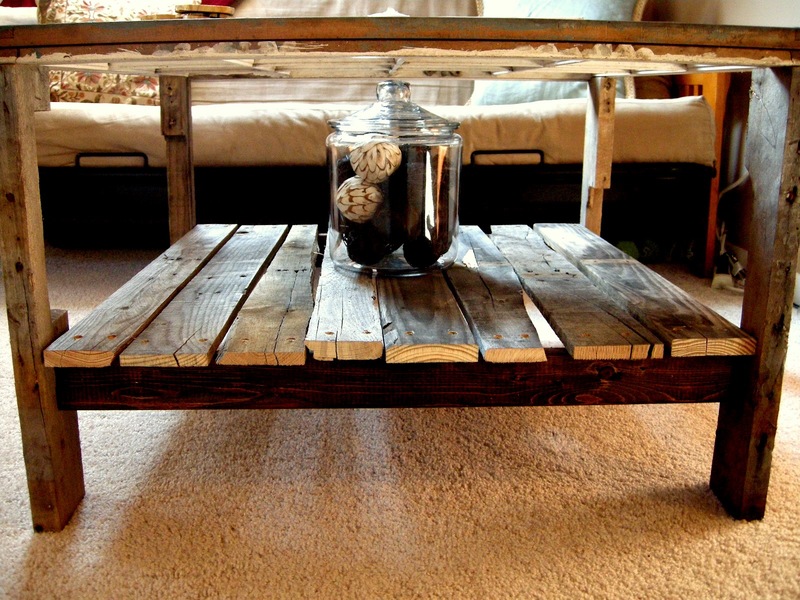 I too have made furniture from pallet wood. If Josh ever felt like sharing how he did it I'd be interested in hearing! hey justin! hope you are well! 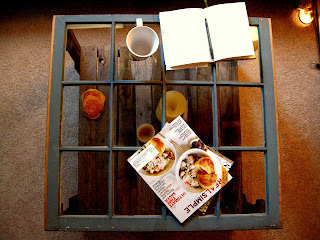 josh said this table was a pretty easy design since the window is a big part of it (we found that one the side of the road). he just took the support beams from the pallet board to use as legs, then used the main pallet beams for the bottom shelf. he put a couple of pieces of wood underneath the bottom shelf for support. on this one, he just put them on each side and attached them at the corners, but he said he'd put them in an X shape across the bottom and also under the window for extra support next time. 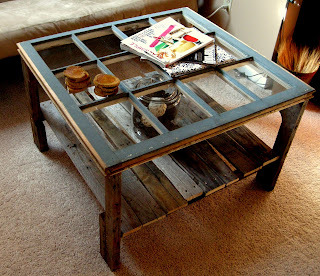 pallet board makes for fun and interesting furniture. have fun!! How sweet that you're making this for your wife! This table was a surprise from my husband and I loved it. The table measures 30"l x 32"w x 20"h. Hope that helps! How did he attach the legs to the window?? Hello! He just used screws to attach the legs to the window. The screws are on the inside part of the leg so you can't really see them unless you crouch down. If he did it again, though, he'd probably reinforce it more. It's loosening a bit these days. Hope that helps! Hi, Elli! No, the window is right-side up. 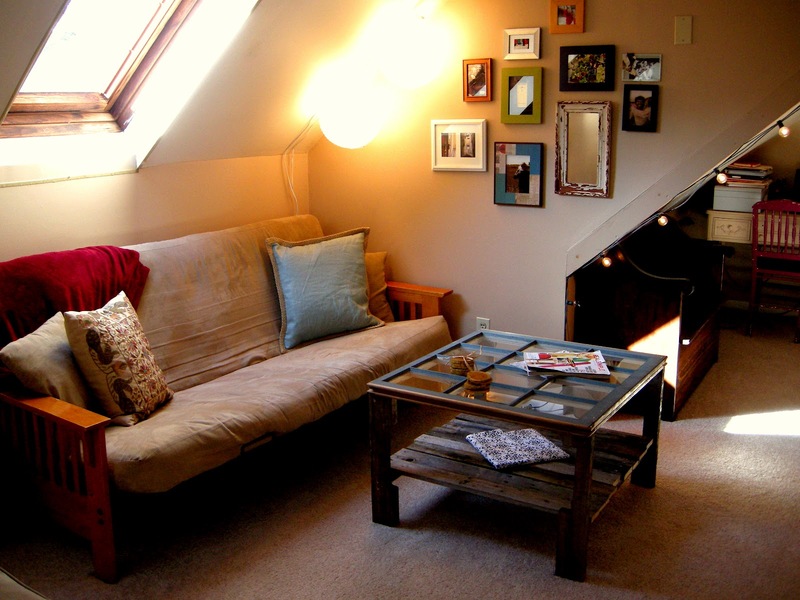 The panes do stick up a bit, but we ended up putting a wooden tray on top to stash things. 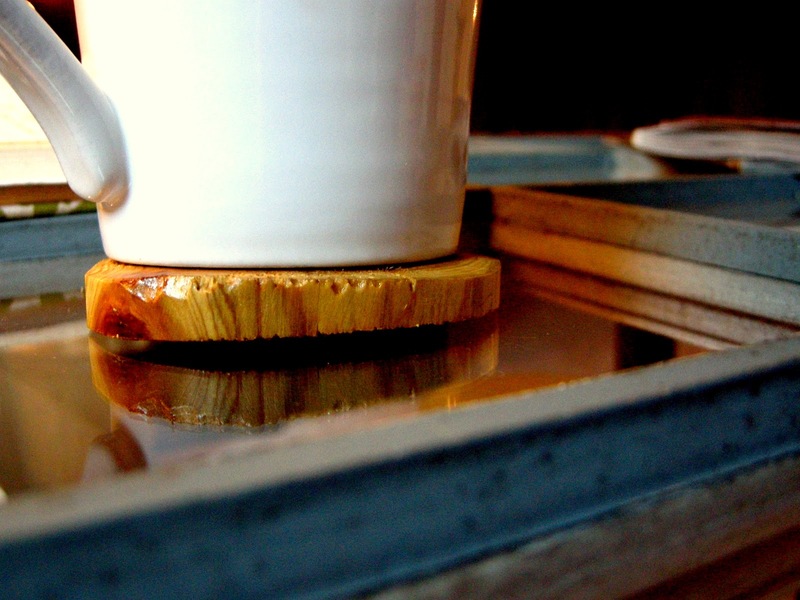 The panes made for perfect little squares to throw coasters and set drinks down. Plates and other dishes had no trouble sitting over top of the panes. Hope that helps. 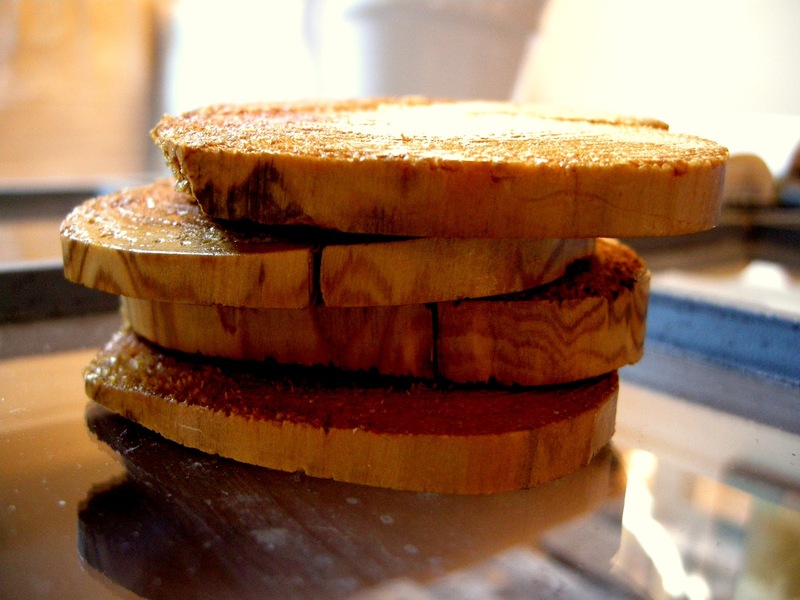 Are the wood around the panes turned down to make a smooth surface? I love the look. Beautiful.